Woody Allen is an American actor, author, filmmaker, comedian, playwright, and musician, whose career spans more than six decades. 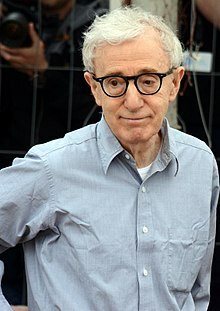 Woody Allen (born Allan Stewart Konigsberg, December 1, 1935) is an American actor, author, filmmaker, comedian, playwright, and musician, whose career spans more than six decades. By the mid-1960s Allen was writing and directing films, first specializing in slapstick comedies before moving into dramatic material influenced by European art cinema during the 1970s, and alternating between comedies and dramas to the present. He is often identified as part of the New Hollywood wave of filmmakers of the mid-1960s to late 1970s. Allen often stars in his films, typically in the persona he developed as a standup. Some best-known of his over 40 films are Annie Hall (1977), Manhattan (1979), and Hannah and Her Sisters (1986). In 2007 he said Stardust Memories (1980), The Purple Rose of Cairo (1985), and Match Point (2005) were his best films. Critic Roger Ebert described Allen as "a treasure of the cinema." Allen won four Academy Awards: three for Best Original Screenplay and one for Best Director (Annie Hall). He also won nine British Academy of Film and Television Arts Awards. His screenplay for Annie Hall was named the funniest screenplay by the Writers Guild of America in its list of the "101 Funniest Screenplays." In 2011, PBS televised the film biography, Woody Allen: A Documentary, on the American Masters TV series.